Word for Today: There is mighty power in the Blood of Jesus. There is mighty power in the Blood Of Jesus. There is power mighty in the blood of Jesus. If there is one prayer point you have to pray every day, let it be the blood of Jesus. Whether, you believe it or not, there is deliverance, freedom, healing, sanctification and power in the blood of Jesus. I have to admit that a natural man cannot understand why such simple phrase as: ‘Blood of Jesus’, is loaded with so much powers. 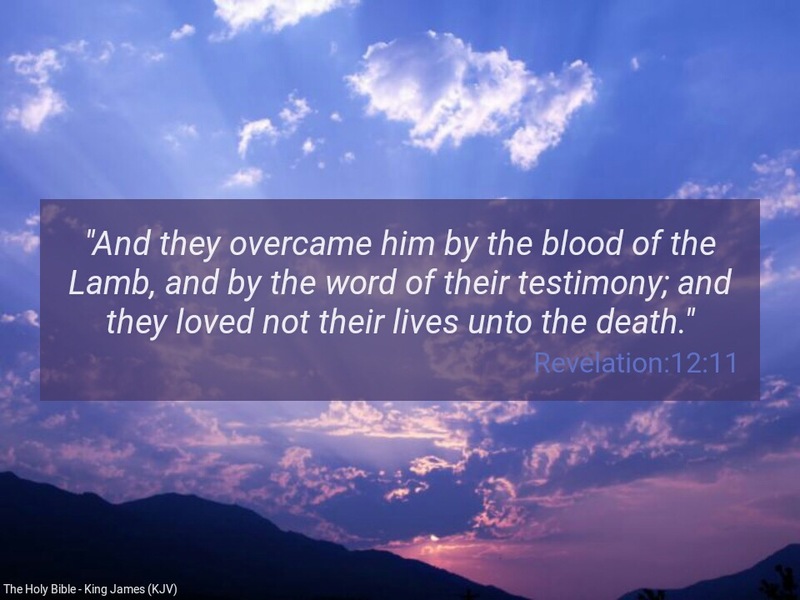 We overcome the devil and his cohorts with the blood of Jesus. The blood of Jesus delivers/set free; the blood of Jesus cleanses; the blood of Jesus empowers; the blood of Jesus speaks . Whether you believe me or not, life is a battle. Everyone fights the various battles of life, whether you believe in God or not. The word of God says : “my people are gone into captivity, because they have no knowledge” (Isaiah 5:13). Jesus Christ is the Captain of the army of heaven. He rides in a white horse. His names include: “Faithful and True and in Righteousness he doth judge and make war” (Rev 19:11), and “his name is called The Word of God” (verse 13). He wages war with sword from his mouth: “And out of his mouth goeth a sharp sword, that with it he should smite the nations…”(Rev 19:15). Every true believer is a soldier of the cross. But, “the weapons of our warfare are not carnal..” (2Cor 10:4). Every day, plead the Blood of Jesus on yourself, your family, your neighbourhood, your place of work, the church and your nations. Blood of Jesus! Blood of Jesus! Blood of Jesus! There is someone reading this message , may you receive the grace to plead the blood in Jesus name, Amen! If you would like to dedicate or re-dedicate your life to Jesus Christ, please pray with me: Lord Jesus, I confess my sins to you right NOW. Please, forgive me and have mercy on me. Thank you for dying on the cross for me. Kindly fill me with your Grace, Mercy, Word, Holy Spirit and write my name in the book of Life. I plead the BLOOD of Jesus over my life. I believe I am now SAVED. Thank you Jesus. Amen! CONGRATULATIONS! Please, look for a nearby Word based Church to fellowship regularly. Feel free to keep in touch with the Ministry of the Word if you are led. Bro Ben Bassey is a psychiatrist and a spiritual health counsellor resident in the UK. He ministers to people regularly through the MOW, WordPress Ministry and Abasi Health Foundation (AHF). He is a true disciple, teacher, evangelist, prophet, missionary, and ambassador for JESUS CHRIST. He has a passion for the Word of God and is a strong Defender of the Truth. He was baptised in the Holy Spirit on the 10th February 2008. Previous Previous post: Word for Today: There is no greater LOVE.